Hold these new light up Mardi Gras throws in your hand and all eyes will STOP – and turn to you. This year you'll find one of the most popular new throws are light up trinkets – balls, beads, throw toys, wands, and plastic sticks. Plus all sorts of unique and special throws like crowns and rings. And at Toomey's Mardi Gras, you'll be overwhelmed at the selection you'll find for light up throws. Here's a breakdown of the top 10 most unique light up items in Toomey's for Mardi Gras 2018. Keeping with the spirit of Christmas, these light up balls will put a smile on everyone's face. These come packaged with 12 rubber, bouncy balls so you'll spread plenty of Christmas cheer with these. You'll have fun at the parade by tossing Christmas Trees, reindeer, Santa, and Snowmen to the crowds! In ancient times, only very powerful people were able to crown royalty. This Mardi Gras, you'll do it in an instant. These plastic headband crowns light up at the flip of a switch. Each bag has a mix of purple, green, and gold and comes with 6 crowns to a bag. They make a great parade throw or party favor. In a single second, you'll make someone in the crowd a special king or a queen. If you're looking for a special light up Mardi Gras throw that will make you stand out from all the others, then this is for you. These are new to Toomey's. These are our the new squishy light up rubber pigs. You'll fall in love with them as soon as you pick them up. You purchase these in packages of a dozen. Each package contains four pink, four yellow, and four green light-up pigs. If someone has a bad day, how do you brighten up their day? If you want to brighten up the crowd during Mardi Gras this season, then you'll want to add these light-up flowers to your bag. You'll see here the new light-up squeaky sunflowers. You can pick them up in boxes of 12. They come in four different colors – 3 Orange, 3 Pink, 3 Green, and 3 Yellow. Each sunflower measures about 3 1/2 inches wide. With these throws, you'll spread the fun one squeaky sunflower at a time. This light up throw is a whirlwind of light in your hand. It's a guidepost of fun. They'll see you coming a mile away. This throw is about 15 inches tall – it spins and lights up. It comes in two colors – red and blue. You'll be a beacon during Mardi Gras, even at night. Trust me, all eyes will turn to you when you hold this up. It's a rare gem among Mardi Gras throws. These light up spikey balls have been very popular during many parades, including the local area boat parades. You can purchase these flashing balls in boxes of one dozen. In each box you get four pink balls, four green balls, and four yellow balls. Each ball is about 2.5 inches in diameter. These light up spiked balls make a great parade throw. Do you want to reach the back of the crowd with your Mardi Gras throws? Do you want to toss something to the guys and gals up high on the roofs, terraces, and balconies? If that's you, then these light up footballs are for you. Shown here are the mini-footballs. These come in a box of two dozen. Each footballs is about 2”. Each box has a variety of colors. They may differ from those pictured. These are the perfect parade throw for big crowds and tossing to high places. These light up sticks are a fun treat for kids and adults! These throws are light up plastic sticks with yellow emoji faces. They light up when you tap them. Each box come with 12 emoji sticks - two of each face. These light sticks make a hilarious and fun parade throw or party favor! Just look as these throws, would you? These little guys light up at the push of a button. They stand 4” tall and his head measures 2” across. 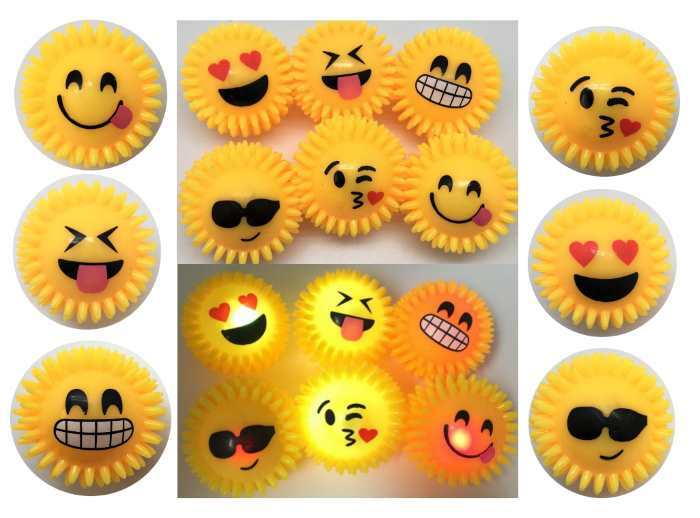 These light up emoji balls might be the best Mardi Gras throw you'll get this year. They're easy to throw. They light up. And they each have a fun little face on them. You can pick these up in bags of one dozen. Each package some with 6 different emoji faces. They measure approximately 3" by 3"
These light up emoji balls have the potential to be the best Mardi Gras throw this year. Make sure you include them in your mix.